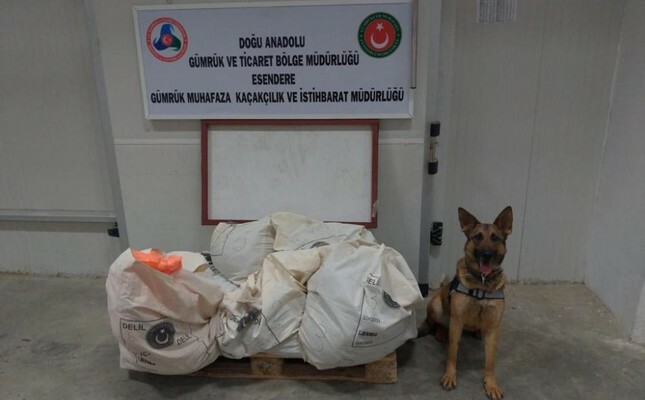 A sniffer dog poses with explosives it helped seize. Turkish customs enforcement officers seized a large amount of explosives at the Turkish-Iranian border, officials said yesterday. According to a statement from the Trade Ministry, an Iranian citizen tried to cross the Esendere Customs Gate with a valid passport. He had six sacks and a suitcase with him, which he said were filled with limes. The officers grew suspicious and brought sniffer hounds trained to detect explosives. It was found the sacks actually contained 221 kilograms of potassium chlorate, a key ingredient used to make explosives. The suspect has been arrested and remanded into custody. An investigation has been launched to check the suspect's possible links with terror groups, the statement added.